A role-playing game of high fantasy. 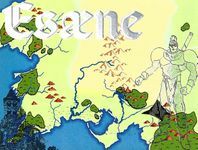 BaDGe Publications' new role-playing game Esaene is a great leap forward for role-players everywhere. Incorporating a unique character development system that stresses substantive achievements , with a universal magic system whose only limitation is imagination, Esaene is ready to challange you. The World of Esaene is a high fantasy world full of wonder and excitement. The realms of the giants, dwarves, elves, and goblins beckon the adventurer to come exploring. And the intrigue of the great human trader nations demands intelligence and charisma to successfully navigate the political dangers. Esaene was distributed as a folio containing four small saddle-stapled books and five full-color maps. Review of Esaene by Brant Guillory.